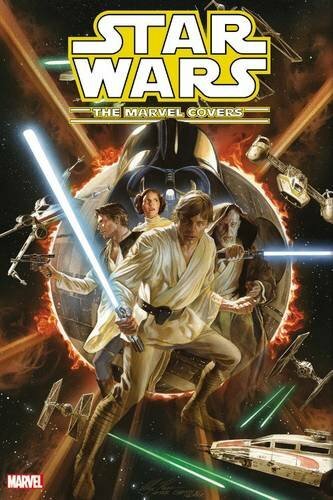 With the first salvo of the trade collections of Marvel’s Star Wars material now out, it’s an excellent opportunity to kick off a new series that takes an askew look at the trades. 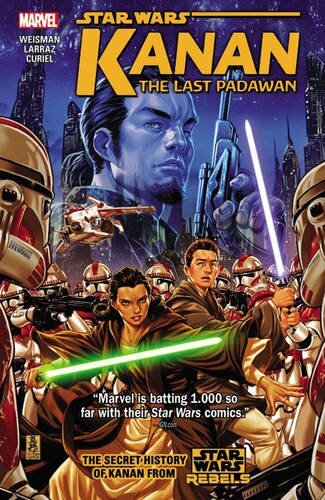 This inaugural edition will be looking at Star Wars: Volume 1: Skywalker Strikes, Darth Vader: Volume 1: Vader, Princess Leia, Kanan: Volume 1: The Last Padawan, Shattered Empire and Star Wars: The Marvel Covers: Volume 1. On their superhero lines Marvel have often used a core book technique, with one book being the high-profile one where the big events happen, with a second in a supporting role. One of the things they like to claim is both can be read on their own. To a degree, that is true, to another degree it’s utter rubbish. 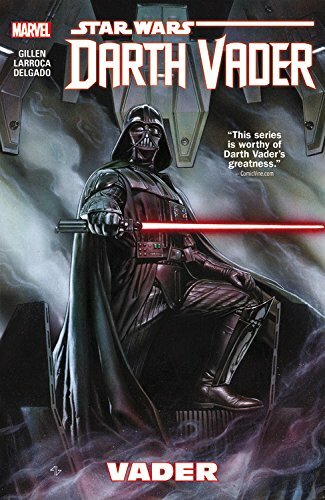 You can read the Darth Vader book without reading Star Wars, yet what goes on in the latter is often in response to what goes on in the former! Kieron Gillen does his best to enable the reader to know what they need to for the story he’s spinning, but it’s still a reductive summary at best. The main book does indeed start off with a bang and if Marvel are doing one thing very well – it’s setting up excellent creative pairings for particular arcs. John Cassaday is not – as anyone who ever read Planetary will attest – a monthly artist, but Marvel gave him enough lead time to have all six issues done! What he has going for him is an excellent narrative style that gives a great sense of energy and movement to the panels. The story also works on the basis that while people may talk of the Force, they know little of it or what command of it permits the likes of Vader to do. Had they known? Events would have played out very differently! As it is, we have Chewie armed with a sniper rifle – and that’s an inspired image – trying to take out Vader and failing due to the target using stormtroopers as shields, plus lightsaber to block the shots and then telekinesis to collapse Chewie’s sniper’s perch! Cassaday draws the entire sequence brilliantly and the story just keeps rolling from that point on, all the way up to them commandeering an AT-AT and trying to stomp one Dark Lord. That doesn’t work either but the sequence is great. The only thing that doesn’t work for me in this opening salvo is the idea that Luke and Vader should cross paths long before their duel on Cloud City. Aaron executes it as best he can, but I can’t say I like it. Knowing what has gone on, in full, in the main book enhances the Darth Vader title considerably. Gillen is in his element, as the story details all kinds of nefarious plotting, both by Vader and his psychopathic boss from hell. There’s Vader being undermined by Sidious, whose plans then get messed with by his vengeful subordinate, plus a few new players. These include a brilliantly messed-up take on the droids, by giving us a pair of metal mass-murderer variants. What also plays into reading them both in collected form is that the books will have continued on. For some, looking at future issues or hearing news stories about those future stories will constitute spoilers. For others, the information will only encourage them as it gives a sense of direction to the books. In this case the news a few months back of the now-current Vader Down event will either attract or repel readers. Those who loathe events will groan, others will be more open to it. That said, Marvel’s event stories are always aimed at one thing: getting you to buy more books! If you had told me a book with Mark Waid and Terry Dodson would misfire I would have been skeptical. Yet with Princess Leia that’s exactly what happens. In a way it could be seen as a case of soaring ambition let down by limited space and an unusually clunky script. So what does it have going for it? It does add to the excellent reverse extrapolation from Return of the Jedi that the new material has been doing all along. From the start there was talk of the rebel fleet and multiple follow-up attacks on Imperial targets in the wake of the Yavin victory. Previously, you could get the sense what was thrown at the Death Star was all the Rebellion had and, though they won, they were very low on resources afterwards. In the new stuff that is not the case; the Rebellion appears to be considerably larger, with more significant material resources. Instead of building up to the acquisition of the fleet and the Mon Cals, the new stuff has it there from the start! What this miniseries adds is that it has all rebel fleets converging on Yavin to enable a very quick evacuation. Oh and it also has an incredibly grouchy Ackbar! So how many variants were there for Star Wars #1 – fifty? Sixty? One hundred? Well, more and less than you’d think and Marvel didn’t stop there either. The cost-effective way to get those variants? The Covers volume. Even better is the fact that the collection of covers it gives you does not have all the title lettering getting in the way. It also has a set of articles showing black and white versions of some of the art and behind the scenes info on how the stories came about. If you’re interested in either the cover art or the story behind the stories, or are a fan of comic art generally, it’s a great hardcover to get and it’ll be far cheaper than attempting to bag all the actual variants. For anyone who has enjoyed the Star Wars Rebels series, Kanan is well worth looking at. It fills in the gap between where we see him at the start of A New Dawn as a padawan and where we see him later. It also underscores two points: one is the sheer traumatic nature of the Jedi’s betrayal and murder by the clones in the wake of Order 66. Second, it explores how the clones’ sense of volition was also violated by the order. Their pursuit of Kanan, as a kid, goes way past being rational; in fact, where Jedi are concerned, the clones act like men possessed. Finally there is Shattered Empire. Of this first salvo, this surprised the most given the mixed response to the issues. For myself, I expected to enjoy it as I’ve enjoyed a great deal of Greg Rucka’s work over the years. What I did not expect was to enjoy it as much as I did. Part of the reason is it has some truly inspired sequences like an attack on an AT-AT in a city – that kind of battle in an urban setting? In a comic, no less? It requires some hefty visuals – fortunately Marco Checchetto was more than up to the demand. It also manages to weave in excellent cameo appearances from all the main and even a handful of supporting characters from ROTJ. Finally, it has something lacking in many stories – a sense of subtlety and respect for the reader’s intelligence. This comes to the fore in the final chapter where there are answers to what has been going on, but it does not spell them out. Instead it is left to the reader to piece it together, following the strands from previous chapters. All in all it’s an interesting and surprisingly mixed salvo of releases. One thing they should cease immediately is padding out trades with reprint material as happened with Shattered Empire, just lower the price instead. It’s an encouraging set too, as it represents a set of Marvel’s top-tier creative staff on what have become some very high-profile books, selling far beyond what anyone could have reasonably projected. The next salvo of trades is due January 2016 – see you then.